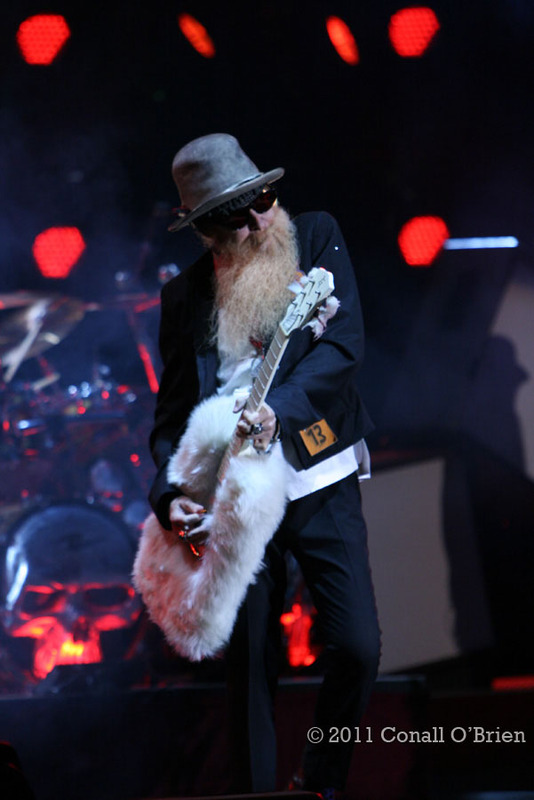 ZZ Top is a guitar-heavy Texas Blues type American band. 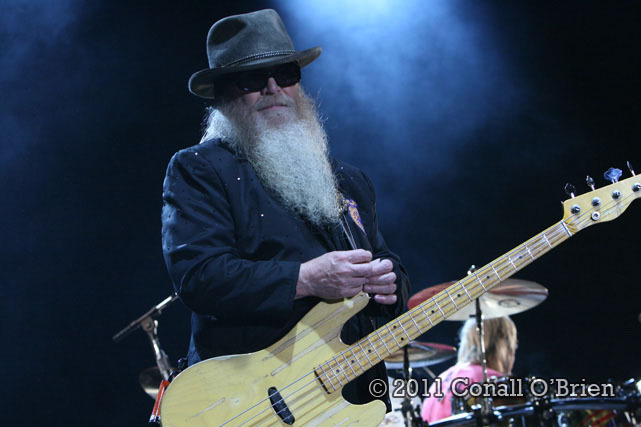 As a huge fan of fellow Texas musicians Janis Joplin (RIP), Stevie Ray Vaughn (RIP), Edgar Winter, Johnny Winter etc. it was almost a dream come true to create images of these genuine roots musicians, who's slide guitar and driving bass go back to when Billy Gibbons created ZZ Top in 1969 as a blues rock band. A band who's longevity and band integrity is unsurpassed, ZZ Top is among the most popular touring acts in the United States and by the mid-70's were breaking various concert attendance records. 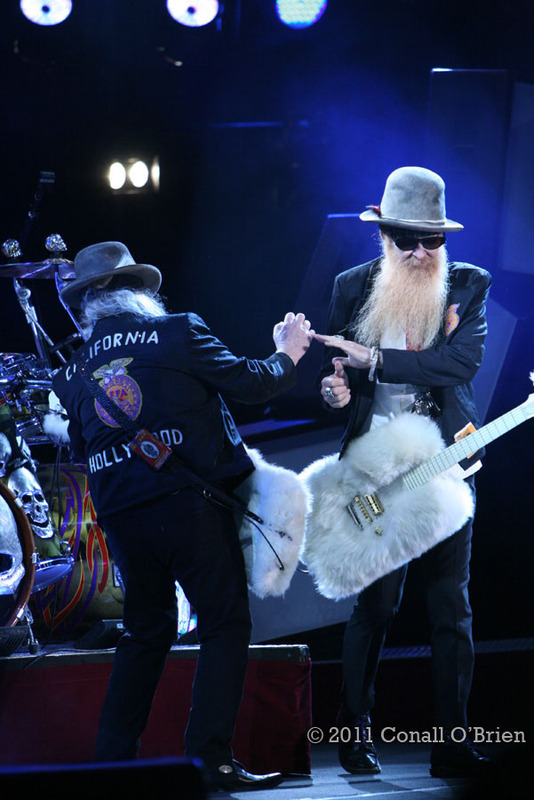 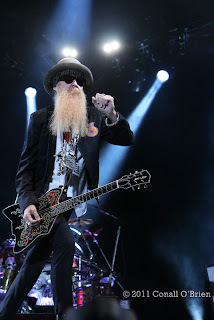 ZZ Top's Billy Gibbons, Dusty Hill, and Frank Beard comprise the longest running band that still consists of all of it's original members, and who had only one manager from 1970 up until a few years ago. 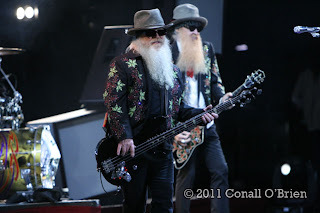 As many listeners have noticed, drummer Frank Beard ironically is the only member without a beard, and I learned it was during a two year break in 1977 that Gibbons and Hill actually grew their signature chest-length beards. 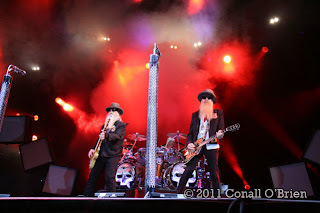 ZZ Top plays Bangor, Maine for an estimated 8000 people. 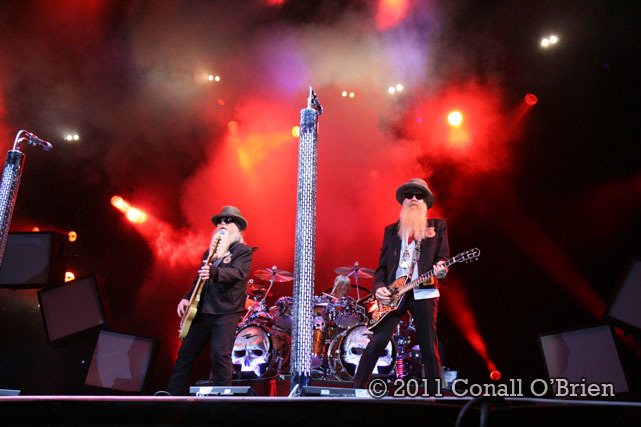 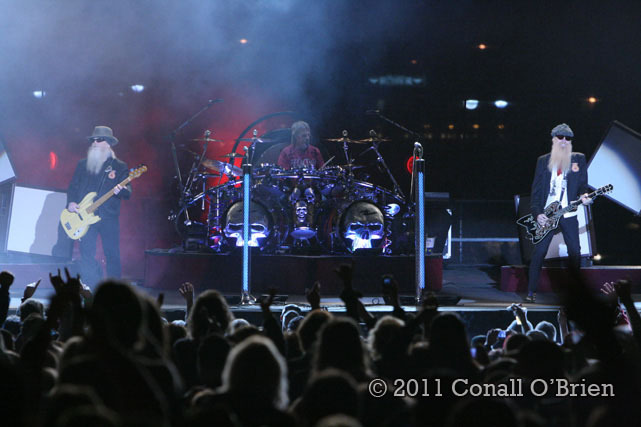 Referred to as " That little ol' band from Texas", ZZ Top and opener Lynyrd Skynyrd ( as part of Rebels and Bandolero's Tour) played a POWERFUL set , the second show of Waterfront Concert's 2011 Summer Schedule in Bangor, ME. 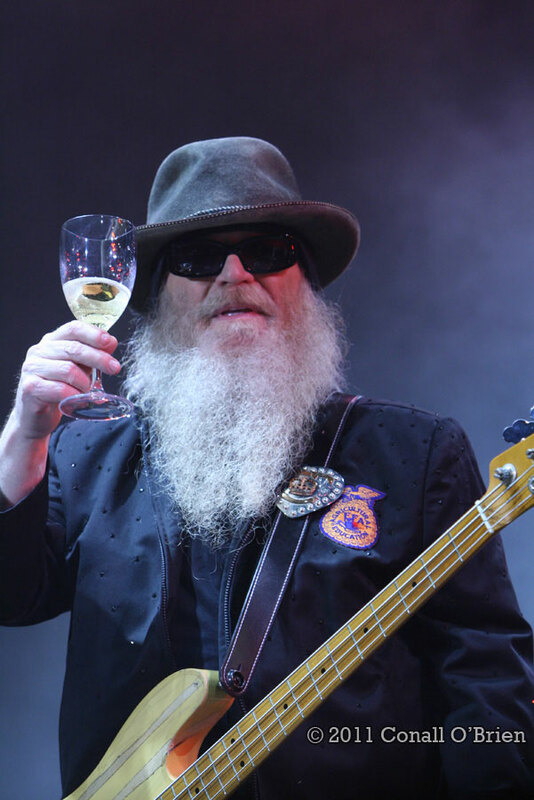 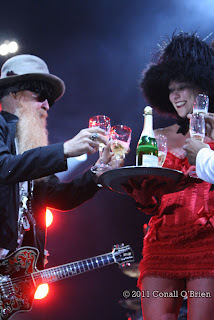 ZZ Top Stage Hand pours Champagne as it was Dusty Hills Birthday. A toast to Dusty and ZZ Top ! 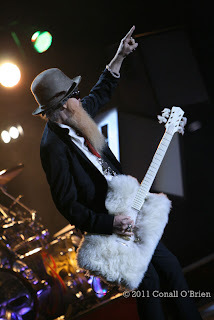 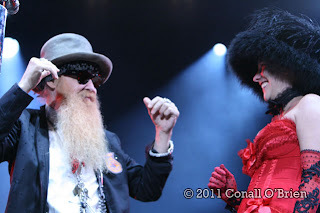 ZZ Top - Class Act who plays a powerful set. Billy playing the ZZ Top hit " Legs". A big thank you to everyone at Waterfront Concerts in Maine for the good times seeing ZZ Top and Lynyrd Skynyrd play on the Bangor Waterfront.